Milk doesn't always quench an adult's thirst, but it does the trick for babies. Breast milk and formula are the main drinks your 11-month-old needs, but once your child starts solid foods around 6 months of age, you can offer small amounts of water. This is particularly important on very warm days or if your child is constipated. Limit the amount of water your child receives because too much can cause health problems and interfere with his growth. 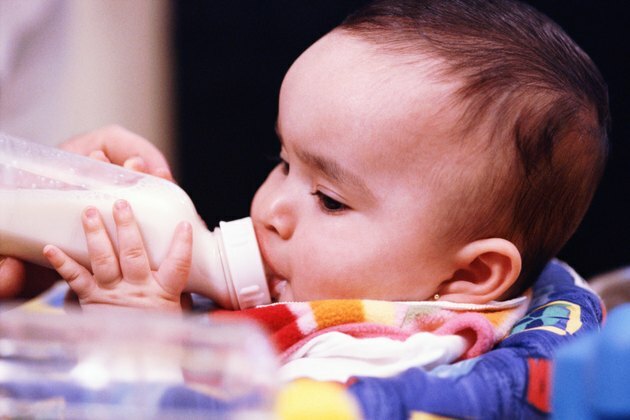 If your 11-month-old is drinking enough breast milk or formula, he does not need water. Dr. Alan Greene, a pediatrician, recommends 2 to 4 ounces of water between meals if your older baby seems thirsty and does not want to nurse or has had 32 ounces of formula. This is especially important on hot days to prevent dehydration. Introducing water at an early age also allows your child to get used to the taste and consistency of it. If your 11-month-old frequently suffers from constipation, speak to your pediatrician about how much water to give her. Dr. Jennifer Shu, a pediatrician at the Children's Medical Group, recommends 6 to 8 ounces a day for constipated babies. Don't go by the number of dirty diapers to determine if your child is constipated because this can vary. Signs of constipation include crying when passing stool and passing hard, dry stool. There is less of a need to supplement breast-fed babies with water because breast milk is composed of 88 percent water. Formula contains extra salt and minerals, and formula-fed babies benefit from small amounts of water to help their kidneys excrete these nutrients. Certified lactation consultant Kelly Bonyata recommends offering a cup of water to older breast-fed babies at mealtimes or allowing them to drink from your cup or straw, which also demonstrates healthy drinking habits. Babies who drink too much water may develop a stomachache. The water also makes them feel full, preventing them from getting the right amount of nutrients needed for healthy growth and development. If you use well water, have the water tested for nitrate because high levels cause nitrate poisoning. Water is still the second best drinking option for your baby. All drinks contain it to some degree, but sugary beverages, such as juice and soda, lack nutrients and provide a lot of empty calories. This can lead to obesity and a preference for sweet drinks in your baby. BabyCenter: When Can My Baby Drink Water? New York Times: Is It Safe for Babies to Drink Water? Will You Lose Weight Drinking 12 Cups of Water a Day?